Underneath RedFarm, the Chinese/dim sum West Village spot, owner Ed Schoenfeld and chef Joe Ng have opened Decoy, a restaurant that focuses on Peking duck. Decoy, 529 Hudson St., New York, NY 10014, 212-792-9700. Stephen Starr's kitschy Philadelphia import, El Vez, has opened in downtown Manhattan. The restaurant serves up an array of Mexican fare, like chorizo nachos, shrimp tacos and even steak. El Vez, 259 Vesey St., New York, NY 10282, 212-233-2500. Tavern on the Green is back! The New York culinary institution shut down and was dormant, lights out, burners off, until April 2014. The chef in charge of the kitchen is Katy Sparks, who is churning out seasonal American fare for the fashionable diners. 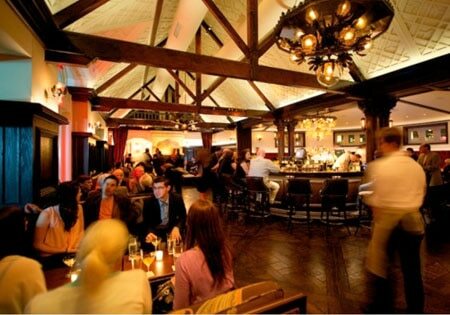 Tavern on the Green, Central Park W., New York, NY 10023, 212-877-8684. In the space that once housed wine-centric Cru and then Lotus of Siam comes Claudette. The team behind successful West Village restaurants Bobo and Rosemary’s has brought the space back to life. The menu features the cuisine of Provence with hints of North Africa. Dishes include chittara pasta with sardines, raisins, pine nuts, guanciale and broccoli, as well as chicken tagine. Claudette, 24 Fifth Ave., New York, NY 10011, 212-868-2424. Huertas, a Spanish restaurant in the East Village, is helmed by former Maialino chef Jonah Miller. The menu is focused on the Basque region and includes plenty of tapas and pintxos. There's even vermouth on tap. Huertas, 107 First Ave., New York, NY 10003, 212-228-4490. In the West Village comes Baker & Co., an Italian restaurant from the team behind NoLIta Roman favorite Emporio. The name is a nod to Zito's Bakery, an 80-year-old spot that closed up shop in 2004. Baker & Co., 259 Bleecker St., New York, NY 10014, 212-255-1234. The new Beautique is not a hair salon. It's a restaurant where Craig Hopson, the erstwhile toque of Le Cirque, churns out creative and inventive dishes. The pastry chef is Jiho Kim, who had previously logged time at Gordon Ramsay at The London. Beautique, 8 W. 58th St., New York, NY 10019, 212-753-1200. Another location of chef Ilan Hall's hot LA restaurant The Gorbals has opened in Williamsburg. This outpost is just above the menswear section of Space Ninety 8, an Urban Outfitters spin-off store. Hall also runs the rooftop bar. The Gorbals, 98 N. 6th St., Brooklyn, NY 11249, 718-387-0195. From China Grill Management comes East & West, a new restaurant inside Yotel New York on W. 42nd St. Chef Bradley Day cooks up his takes on both Eastern and Western dishes, as the name suggests. East & West, 570 Tenth Ave., New York City, NY, 1 877-909-6835. Le Bernardin is expanding with Aldo Sohm Wine Bar, overseen by personable and knowledgeable sommelier Aldo Sohm. On the menu: 200+ bottles, light foods, plus beer and spirits. Aldo Sohm Wine Bar, The AXA Equitable Building, 155 W. 51st St., New York, NY 10019, no phone. Newly opened TESSA, located on the Upper West Side, serves elevated Mediterranean fare like duck lasagna and grilled rouget. The chef is Cedric Tovar. TESSA, 349 Amsterdam Ave., New York, NY 10024, 212-390-1974. The legendary Tavern on the Green restaurant finally re-fired up its burners on April 24, 2014. Its renovation was partly inspired by photographs from the 1940s. Tavern on the Green, W. 67th St. & Central Park West, New York, NY 10023, 212-877-8684. Dominique Ansel, the mad pastry genius and creator of the Cronut, has recently unveiled his latest invention at Dominique Ansel Bakery: the Waffogato, a puck of ice cream that is spiked with waffle pieces and tapioca balls. Maple syrup espresso is then poured over it just before being consumed. Dominique Ansel Bakery, 189 Spring St., New York, NY 10012, 212-219-2773. Alinea, that august eatery in Chicago, is coming to the Big Apple, at least for a short time. Details are scant but it appears the restaurant will open up for a month in October 2014 somewhere in Midtown. Stay tuned. Sara Jenkins, the culinary mastermind behind Porchetta in the East Village, has come up with a new sandwich at her diminutive shop: the porchetta banh mi. The sandwich will be available Thursday to Sunday and costs $10. Porchetta, 110 E. 7th St., New York, NY 10009, 212-777-2151. Alex Stupak has begun serving a dessert tasting menu at his elevated East Village Mexican eatery Empellon Cocina. The five-course menu can be ordered after 9:30 p.m. and costs $45. Dishes include pistachio ice cream and toasted coffee cake, among others. Empellon Cocina, 105 First Ave., New York, NY 10003, 212-780-0999. Rumors are swirling that Eataly, the mega-supermarket and restaurant center that is like a Disneyland for Italian food lovers, will be opening up an outpost in lower Manhattan. The first North American Eataly, located on Madison Square Park in New York City, has been a huge hit since the day it debuted in August 2010. It's being reported the possible location for the Big Apple's second Eataly will be 4 World Trade Center. Eataly, Eataly, 200 Fifth Ave., New York, NY 10010, 646-398-5100. Clinton Hill, Brooklyn, darling Emily is now open for lunch. The daytime menu includes kale salad, sandwiches and, of course, wood-fired brick-oven pizzas. Lunchtime service is Wednesday to Friday. Emily, 919 Fulton St., Brooklyn, NY 11238, 347-844-9588. Il Buco Alimentari & Vineria has just launched a new fixed-price lunch option: three courses of regularly changing, greenmarket-inspired Italian fare for $35. Il Buco Alimentari & Vineria, 53 Great Jones St., New York, NY 10012, 212-837-2622. French gastropub Jacques 1534 has unveiled a new cocktail and food menu. Now diners can feast on classics like steak frites and even such British pub grub as Chatham cod and chips. The signature drink is a Blackberry Collins. Jacques 1534, 20 Prince St., New York, NY 10012, 212-966-8886. Amanda Freitag's Chelsea restaurant, Empire Diner, is now open for lunch, with a menu that includes burgers, sandwiches and salads, like the popular Tuscan kale Caesar salad. Empire Diner, 210 Tenth Ave., New York, NY 10011, 212-596-7523. Le Colonial, the elegant French-Vietnamese restaurant in Midtown, is celebrating its 20th anniversary. Between April 9 and May 31, diners will have the option to choose a six-course tasting menu for the occasion (in addition to the normal à la carte options). The menu features new dishes and classic Le Colonial delights. The prix-fixe dinner costs $80 or $125 with wine. Le Colonial, 149 E. 57th St., New York, NY 10022, 212-752-0808. Alain Ducasse's Benoit is bringing back its cochon Tuesdays for the month of April. Every Tuesday this month diners have the option to choose a portion of one of two slow-roasted suckling pigs. The meal, with beer or wine, is $30 per person. Reservations in advance are necessary. Benoit, 60 W. 55th St., New York, NY 10019, 646-943-7373. Jason Hall, who had logged time in the kitchen at Gotham Bar & Grill, is now wearing a toque at The Fourth. He'll cook alongside owner/chef Marco A. Moreira. The Fourth, Hyatt Union Square, 132 Fourth Ave., New York, NY 10003, 212-432-1324. NoLIta New Zealand-accented eatery The Musket Room has a new pastry chef: Becca Punch, who has maybe the best name in pastry and recently logged time in the kitchen at Eleven Madison Park. The Musket Room, 265 Elizabeth St., New York, NY 10012, 212-219-0764. Ron Wingwee Hsu, who logged eight years in the kitchen at Le Bernardin, is now the new chef at Vietnamese restaurant Le Colonial. Le Colonial, 149 E. 57th St., New York, NY 10022, 212-752-0808. Calliope, the promising French restaurant in the East Village, has shut down. The place will soon become Contrada. Calliope, 84 E. 4th St., New York, NY 10003, no phone. The East Village outpost of South Brooklyn Pizza, selling one of the best slices of pizza in the city, has shut down. Owners claim the pie spot will find a new location and reopen sometime this year. South Brooklyn Pizza, 122 First Ave., New York, NY 10009, no phone. Aska, the acclaimed Scandinavian restaurant in Williamsburg, has closed and will reopen in the near future in a bigger space. There's no word yet as to where it will relocate. Aska, Kinfolk Studios, 90 Wythe St., Brooklyn, NY 11249, no phone. BLT Burger, the eight-year-old restaurant in Greenwich Village, has shut down. The restaurant group behind it, ESquared, plans to open Horchata, a Mexican restaurant, in late spring. BLT Burger, 470 Sixth Ave., New York, NY 10011, no phone.